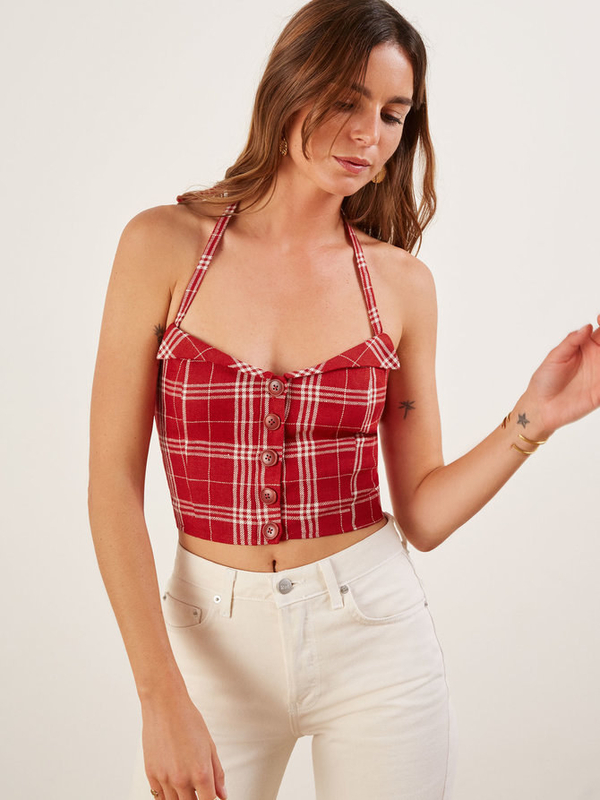 STOP THE PRESS (hehe) because clothing brand Reformation is having a massive sale — I'm talking savings of up to 70% off, sweetheart! THAT'S RIGHT! Gorgeous maxi dresses, basic tees, an open-back jumpsuit that has descended from heaven, mid-rise cigarette jeans, the perfect denim jacket, and so much more. Up to 70% off. I'm sweating. ...which is why you'll want to snag every on-sale item you can get your paws on. 1. A slim fitting ankle length dress so gorgeous, I'm pretty that it's what Ms. McGuire was referring to when she was singing about her dreams in Italy. 2. A must-have jean jacket because fall is APPROACHING and the season of pumpkin spice and denim is UPON US. 3. A fitted black crew tee you can wear from now until the end of time. 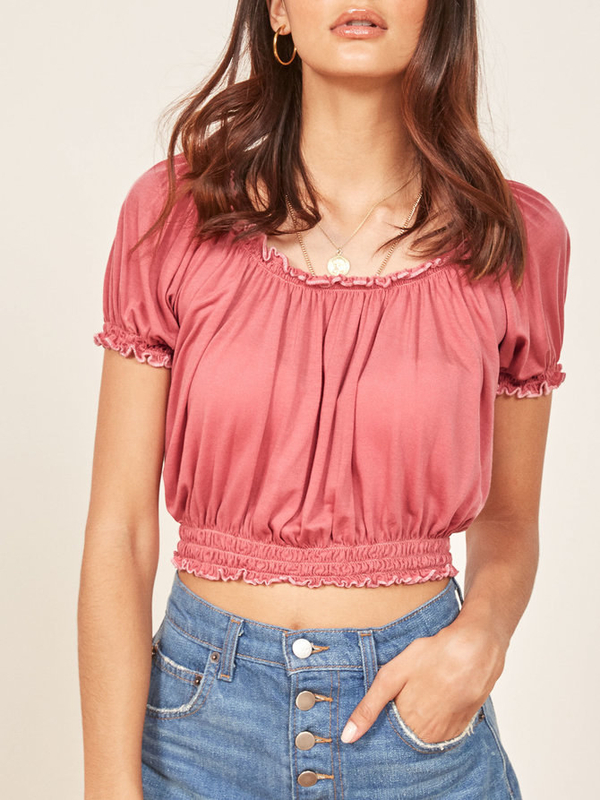 This top pairs well with absolutely anything. V-E-R-S-A-T-I-L-I-T-Y, my friends. 4. A knee-length dress guaranteed to become your go-to LBD. Sorry, former little black dress. You have been replaced. Thank you for your many years of service. 5. An adjustable halter top with a sweetheart neckline that's sure to become your sweetheart. Your soulmate. Your one true love. Price: $29 (originally $98, available in two colors and sizes 0-12). 6. A lilac lace trim top that will make you break out into song. The tune you'll have in mind? "Isn't She Lovely" by Stevie Wonder. 7. A corset-inspired dress I cannot stop staring at. This is the kind of stunner that will make entire HOARDS of people turn their heads and stare. 8. A mini dress you can easily dress down with your favorite sandals OR dress up with a pair of pumps. The world is your oyster with this pretty little thing. 9. 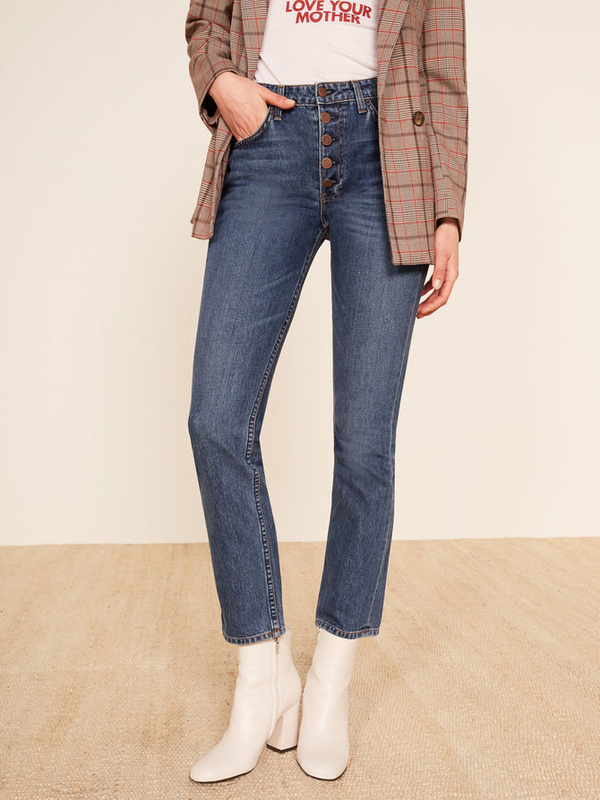 Mid-rise slim jeans with a cigarette leg for anyone looking to graduate from the ultra skinny silhouettes that have taken over their closet. 10. A striped midi dress you can throw on quickly when you're in a rush to get ready. It's simple-but-not-basic, lightweight, and looks like one trillion bucks. 11. A scoop neck tank top in a cherry red color that will become the cherry on top of any darn outfit. This hue = wow. 12. A linen jumpsuit sure to ~jump~ right into your shopping cart. That gorgeous open-back is legitimately making drool come out of my mouth. 13. A long-sleeved midi length dress that will transition perfectly into the season of flannels and pumpkin patches. HELLO, FALL. I have missed you terribly. 14. 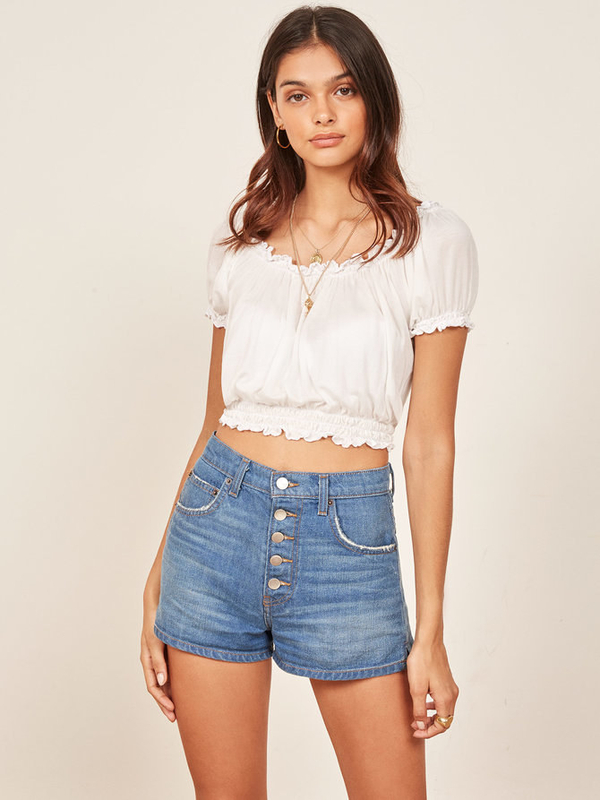 A slightly cropped ruffle top you'll want to pack for your next all-inclusive beach vacay, along with your favorite shorts and a straw hat. 15. A wrap dress everyone will be asking to borrow. Will you let them? HECK NO! You know damn well that you will never get it back. 16. A breezy two-piece set to eliminate all "what top should I wear with this skirt?" dilemmas FOREVER. 17. A tie-strap midi dress perfect for romantic strolls along the beach. The romance I'm referring to is the one between you and this dress, by the way. Want to peruse even more gorgeous options? Check out the rest of the Reformation sale! Have fun, you crazy kids.